Thanksgiving is a day set aside just for that...giving thanks. Have a peaceful, happy, wonderful day. and the air full of awe. Best wishes to you and yours for a magical and peaceful holiday. 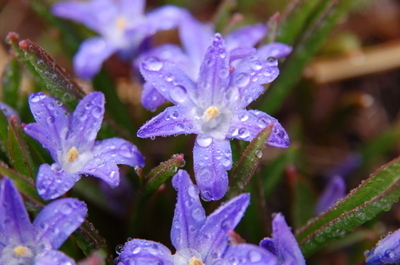 Since I have missed Wordless Wednesday, I thought I would give Three for Thursday a go. Hosted by Cindy at My Corner of Katy, Three for Thursday suggests that your post contain three photos, rants or reviews, in fact, three of anything for a post. I thought I would share with you three glimpses of this seasons' progression. In the top photo, this leaf was spotted in the grass this week. 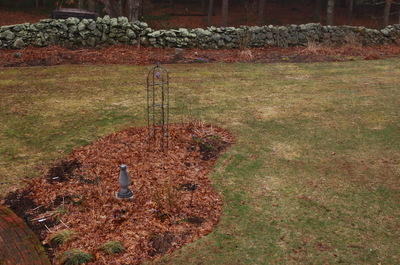 The light levels are diminishing and I see a tint on some of the maple trees which just wasn't there two weeks ago. This next picture is of Hailey's pumpkin. I lifted it ever so slightly to show the EM the etching and the stem snapped. It has colored up nicely though. It is a Cinderella pumpkin for our little princess who has yet to pose with Cinderella. The last picture is of the longest cucumber yet picked from the garden and two tiger melons. The cucumber seeds were from Baker's Heirloom seeds and listed as Japanese long. This one measured 18". They have great flavor and the plants produce lots of fruit. The tiger melon seeds, I think, were also from Baker. This plant was not vigorous and was quickly overrun by the Cinderella pumpkins (note to self: plant further apart next year) and the Waltham squash plants. I did get three fruit which are quite beautiful although their flavor is a bit bland. The dogs like them though so all was not lost. Blue sapphire and other garden shots! 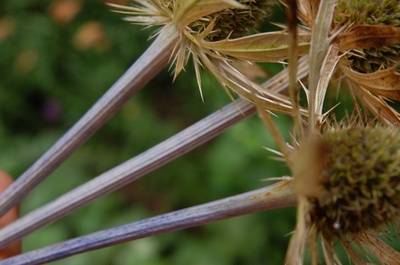 I was sitting at the desk looking out the window the other day when I noticed the stems on the Eryngium 'Blue Sapphire' are much bluer than the flowers have ever been. 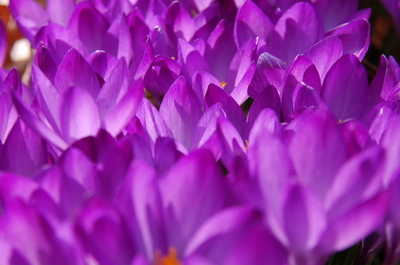 The flowers, and I use the term loosely,are more of an architectural silhouette with no soft petals in sight. They are stiff and prickly and also very interesting but those stems! I am enjoying that blue which is at eye level with the desk. The flowers have faded to brown but remain interesting. 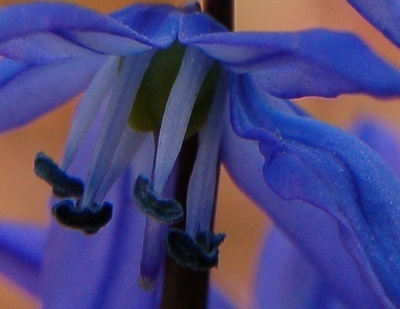 The stems have watercolor splotches of blue. 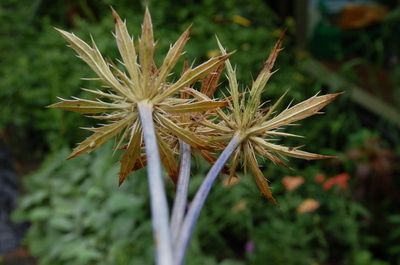 I am thinking that I should add some of the other Eryngiums to my garden as I did see the ones Kris over at Blithewold posted and they are just as curious. I like the large number of flowers in her clumps. 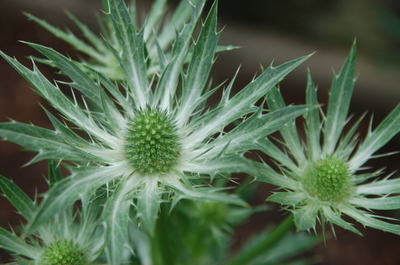 Are any of you growing any of the Eryngiums and what are your thoughts on this Genus? Check out that high for today! It was breezy though which kept the little black flies from swarming. 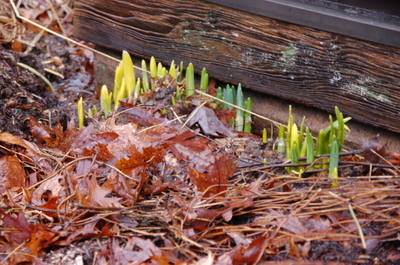 I did see them even though this was the first warm day we have had this year. 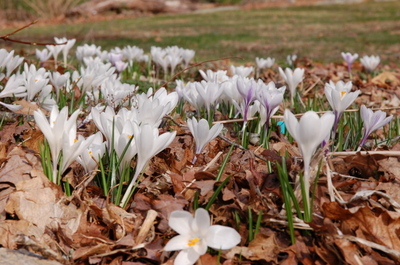 It always arrives well before the gardens are cleaned out. The top photo is the Garden Supervisor, Tucker, on his morning rounds. 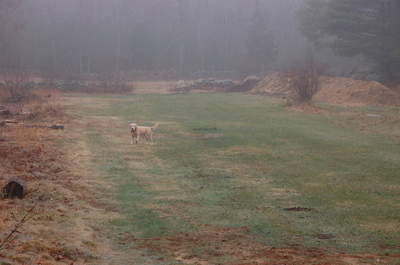 He is a bit miffed as I didn't walk all the way down into the field. I didn't realize what a stiff breeze was blowing until I reached the top of the pasture. Lots of birds were singing this morning and the new bluebird house on the fence post has an occupant. Not a bluebird. I believe this is a Carolina wren and she was quite perturbed that I disturbed her inspection of the house or her nest building. She flew out and started chattering. The wrens sound very pretty to me when they sing. somewhat unearthly charms. 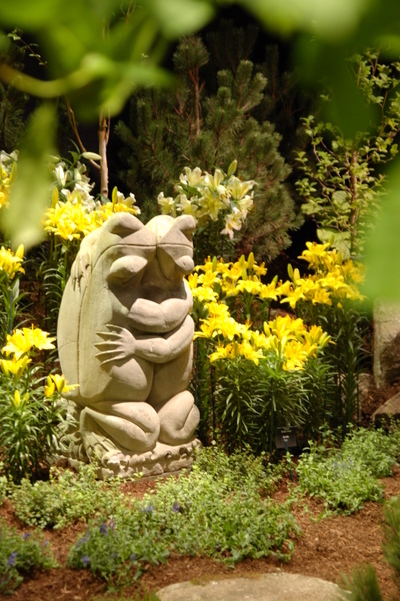 What is charming you in your garden today? 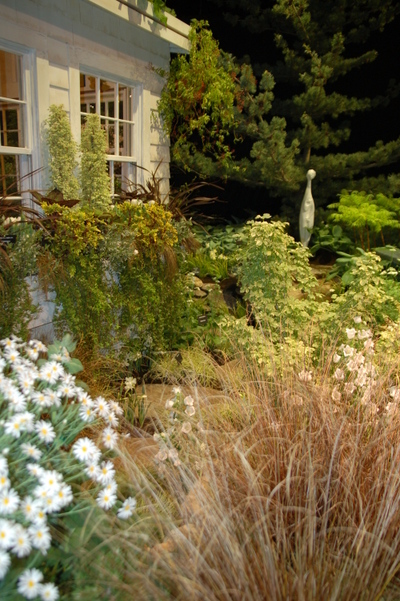 New England Spring Flower Show! 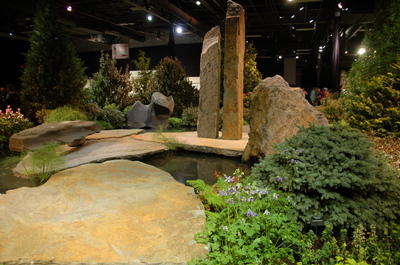 This year's New England Flower and Garden Show in Boston at the Bayside Expo Center runs for over a week starting on March 8th and ending on the 16th. 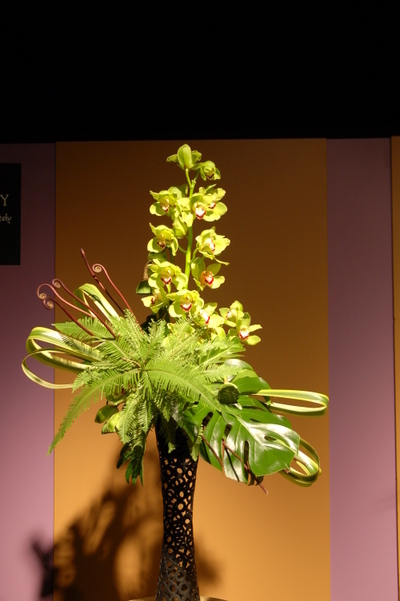 The theme this year is 'Rhapsody in Green'. I love flowers shows, some more than others. 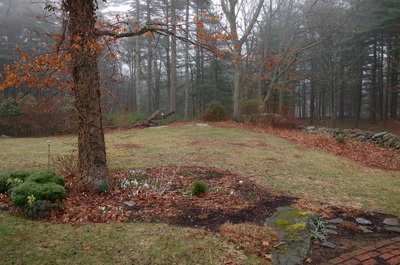 New England winters are long and the flower shows arrive just when the bleakness in the surrounding landscape is at its' peak . At a flower show reality is suspended and perfection in a display is achieved for one short week or less. 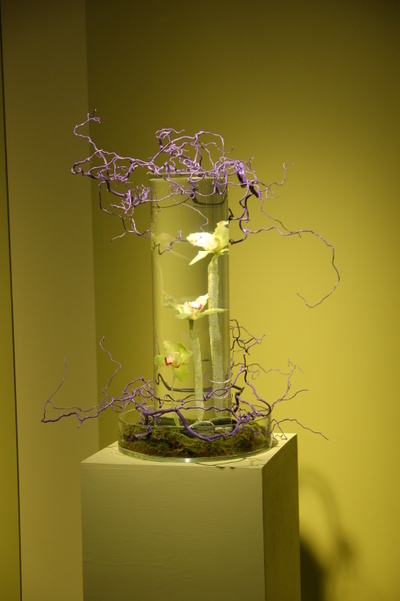 Artistic license allows a designer to incorporate impossible planting combinations into the display with flowers blooming out of sync with one another, a trait I find a bit disconcerting if sometimes enchanting. What I don't like are the crowds packing the hall but, since I am part and parcel of the crowd, this is to be endured and there is always someone interesting to meet. 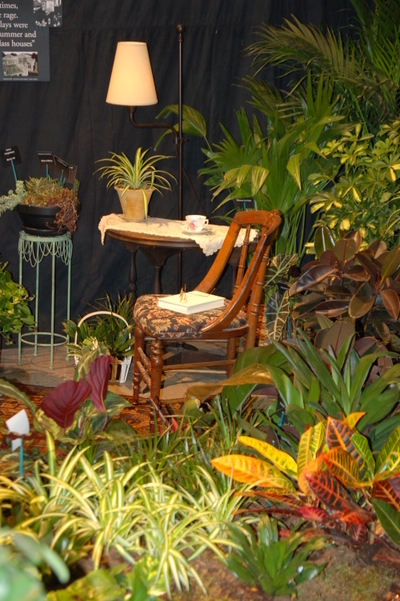 For me, a flower show must have interesting horticulture, great displays and a good speaker list. 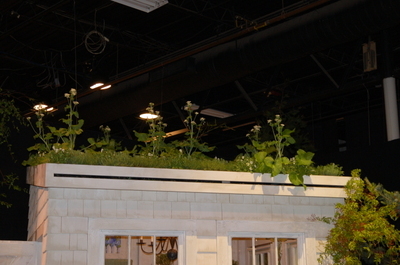 I did find all of these components at the New England show. 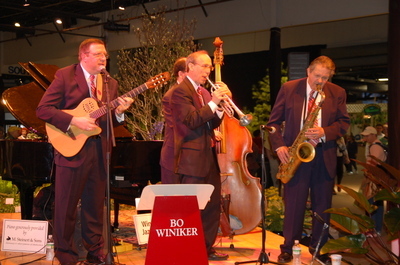 There is always something new to learn in horticulture and design and what would a flower show be without mood music? The music was just an added bonus. 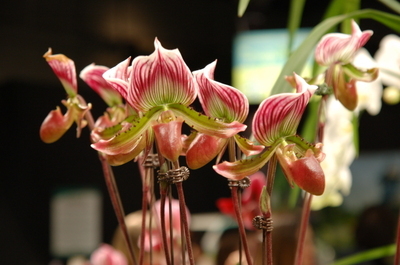 This year orchids seemed to dominate many of the areas at the show including the judged floral arrangements , the educational displays and the vendor area along with bonsai. 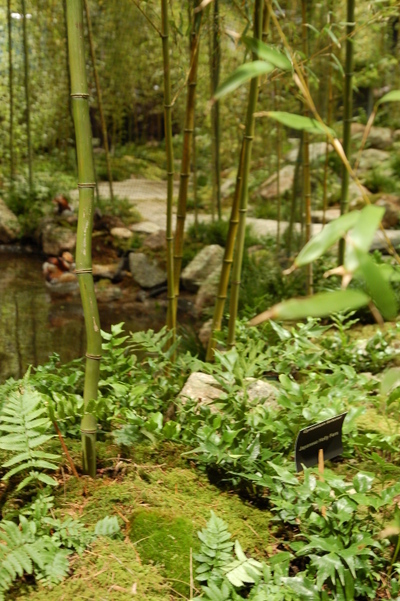 I find bonsai intriguing but have little desire to participate in this form of horticulture. 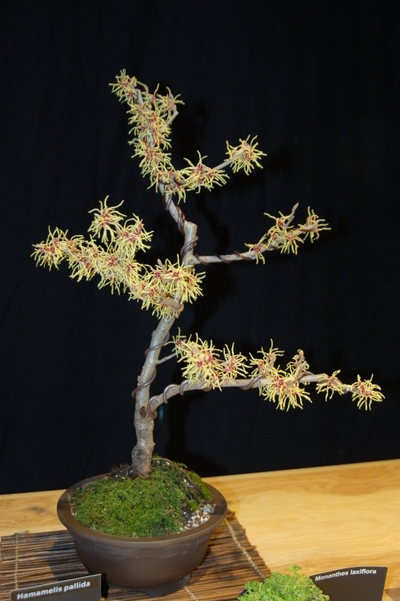 Some things are best admired from a distance and this blooming witch hazel is one of them. 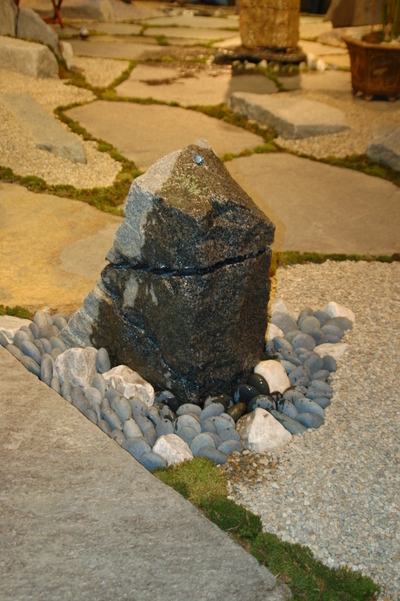 The garden displays at the show this year contained quite a bit of natural stone in the form of patio surfaces, water fountains and walls. I love natural stone, and I understand why many of the designs use block and man made pavers as they are very easy to work with and are uniform in thickness and size for ease of installation but really, natural stone is so much more pleasing visually! 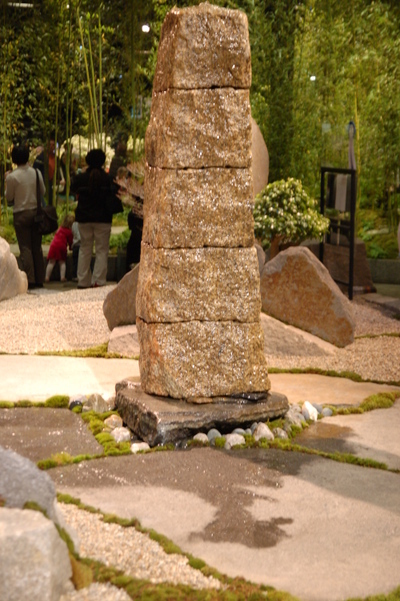 When you consider that each flagstone piece has to be maneuvered and levered into position and then leveled, you can then understand the skills and time necessary to implement such a landscape. 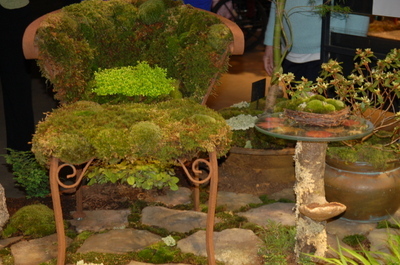 There were many small gardens with inviting sitting areas just waiting for occupants. 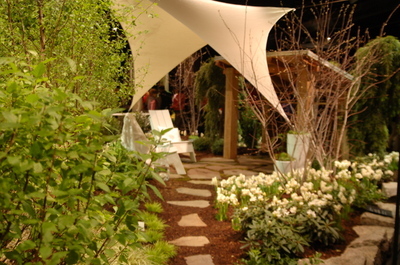 This one had a soothing lavender theme and then there is this design which was a rather large display which included a beautiful water feature and a seating area with this interesting shade canopy. 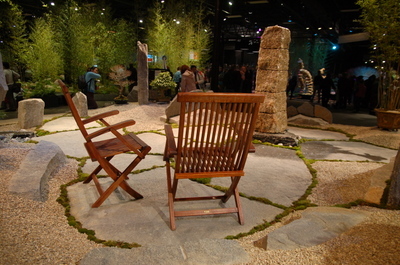 Here is a very traditional tea spot and then this modern garden setting is also represented. 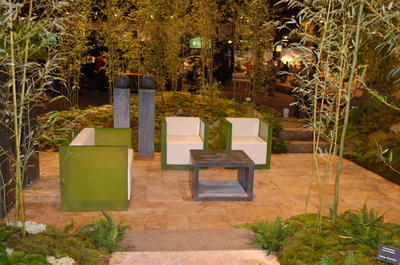 This patio was set within an area surrounded by moss berms and bamboo plantings for a serene, green scene! 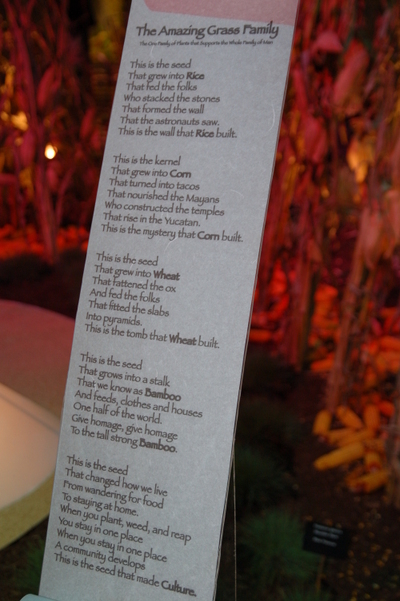 Here is an exhibit on Grass which is educational as well as a pleasing visual compilation of the grass family's contribution to man. The saga begins with this (click to enlarge) rice tablet history and continues with several intertwined and adjoining displays. 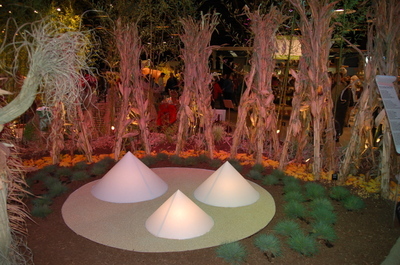 This custom wheat fence was a delight and this I. M. Pei like display I found curious. 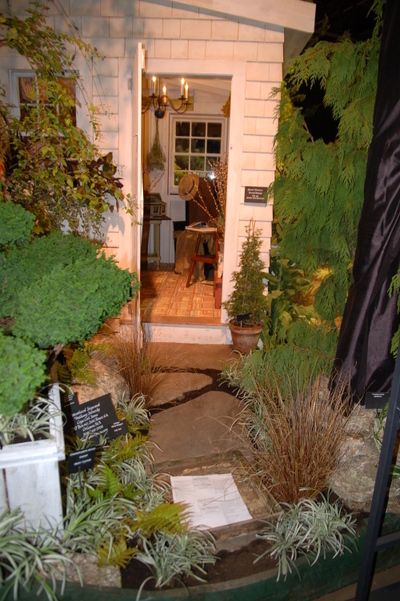 This small garden display seemed to have 'it all' for me. 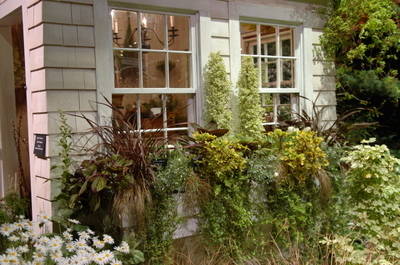 An inviting entry, wonderful window boxes a small display garden with statuary, and an unusual roof. I thought it was well composed and executed, a bit conservative, reflecting the New England flavor but with a decidedly modern twist in the choice of statuary. This was a small, 650 square foot space. A bit packed with plants but then one has to play to the crowd. I decided to go to the show on Saturday primarily because of the speaker, Amy Stewart. 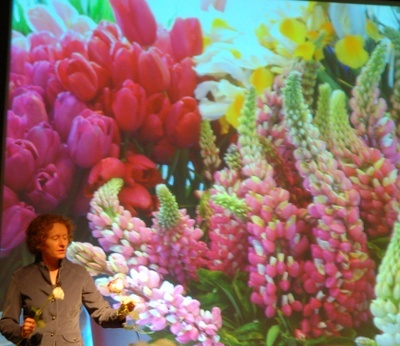 I did work in the cut flower industry for a time and found her book 'Flower Confidential' entertaining and informative. I also enjoy the 'Rant' posts so attending her lecture seemed like an opportunity not to be missed. She did not disappoint! A gracious lady and an engaging speaker topped off a day at the flower show! 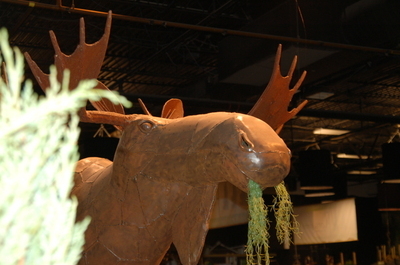 As flower shows go, this one had several treats! This was the picture that greeted Tucker and me this morning! Yes, it is true, I live in a castle with a moat! Poor initial planning and ledge everywhere prevents quick drainage but, then again, this time of year is so muddy that a bit of a foot bath is welcome! 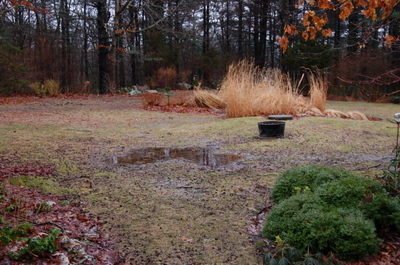 This is the view of the east border across the fish pond which is located just beyond the grasses which need burning. This will take place in the next week or two. 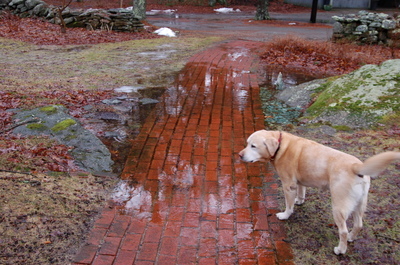 The temperature rose today and the wind was quite spring like and by the time I arrived home, the walk was dried up. 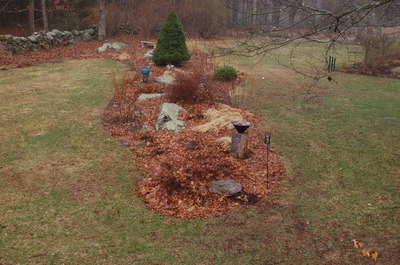 If we have a couple more days of wind and sun there will be raking! 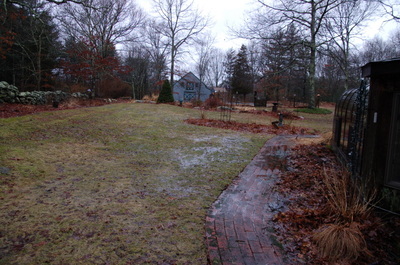 I am looking forward to starting the process of reclaiming the garden. 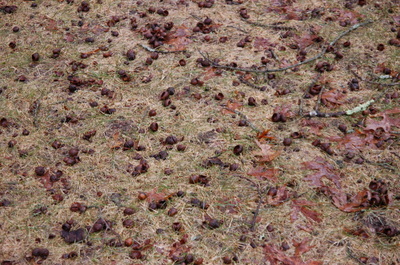 The edges are blurred and this seems to have been a banner year for acorns. I wish the deer would just browse right here! This is the ...what do I call this bed...the Florida bed as it is shaped like Florida when you look at it from the deck. It looks like a mass of leaves doesn't it. I am going to try to take these same shots at the beginning of every month so that the changes are more apparent. Do any of you do this? I think it is probably a good habit to get into. 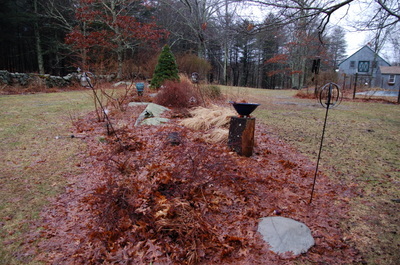 I did see a bit more green today and hope that I can clean this bed out this weekend! It sure needs it! 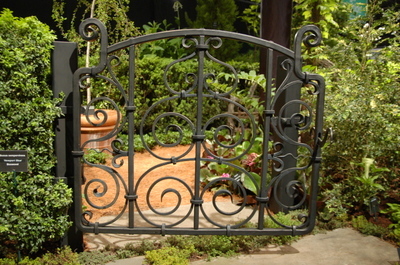 Where do we get our gardening inspiration? Is it genetic? Is it cultural? Is it osmosis? Some of us seem particularly attuned to the rhythm of the seasons and the intrinsic necessity of having plants in our lives. I haven't seemed to teach my children this nor have I genetically imparted the 'plant love' in them. Neither seems interested in the art and beauty of plants and gardening although my son, who is now a homeowner, is having a bit of fun with rocks in the landscape. There is hope! 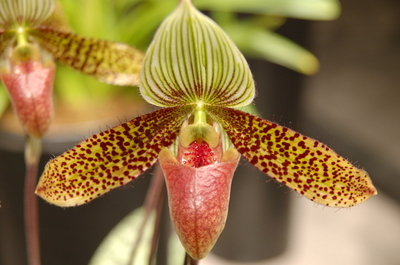 I suspect that my passion for plants was a bit overwhelming for them as any time consuming passion can be. Each one of us probably has a different explanation for their plant addiction. 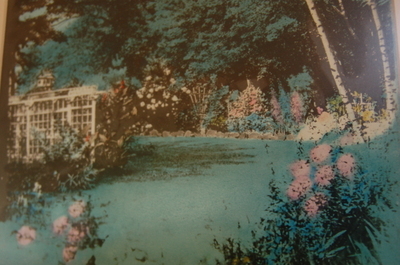 Mine lies, at least partially, in the memory of a garden wonderland created by my grandfather. 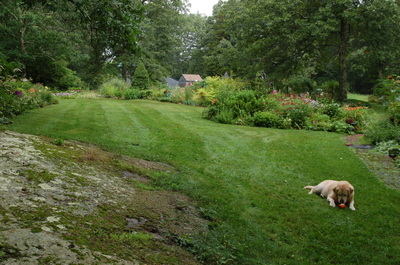 Some of my first memories are those of playing in my grandfather's garden. I was seven when he passed away so we are talking very young memories. My mother's father was an English immigrant arriving in America in the early 1900's. 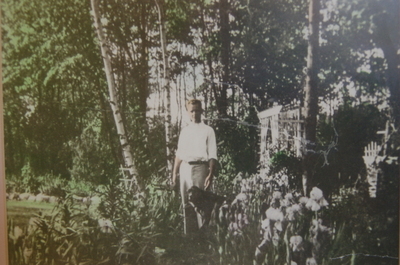 The picture above is a picture of my grandfather standing among his bearded iris. 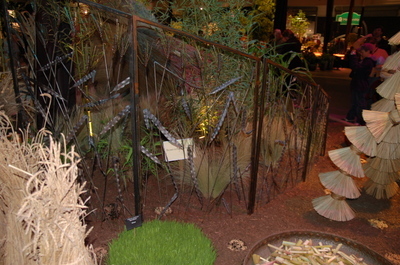 Also visible in the picture are some of the trellises he built. He also built many 'bird apartments'. 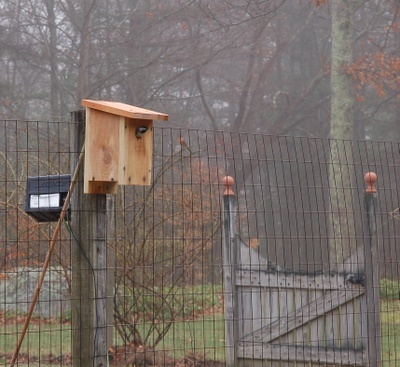 Fred loved birdhouses, trellises and wildlife. 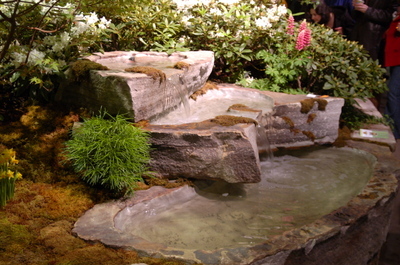 The garden had a fish pond and a stream. Water and children are quite a combination. 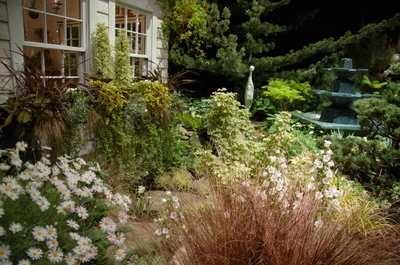 The journey into his garden began on the patio overlooking the sunken garden reached by a set of stairs leading down into the garden. If memory serves me correctly, they were wooden, white and a bit steep and they probably descended about six feet. To a child, that is a big drop! 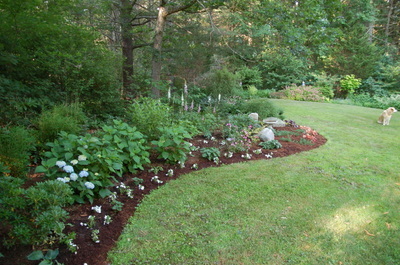 There was a wooden arbor in the center of the garden covered by roses and flanked by cannas. It contained two benches which were great fun on which to climb, sit, dream and play. I remember rose petals strewn on the ground. 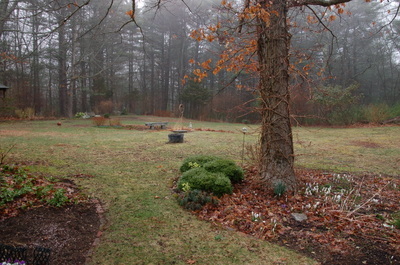 This next picture shows the arbor in the middle of the garden. These pictures were taken in black and white and then colorized. They are the originals and I have no idea what year they were taken. They are priceless to me. I would like to think that my gardens are somewhat reminiscent of his gardens. 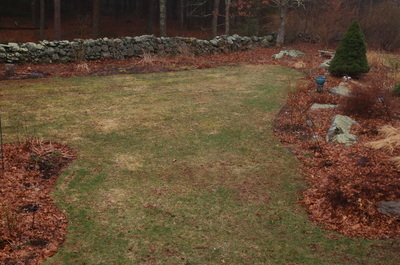 The curves seem familiar to me and the dappled light in my garden has a faint, familar echo of that long ago wonderland. I do have one plant which has survived from my grandfather's garden and which was passed to me by my Mom of brown thumb fame. 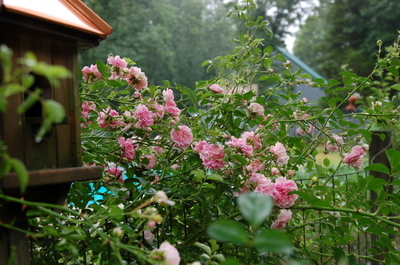 This rose winds its' way up the post to cover the bird house. It blooms profusely and is subject to defoliation from black spot which doesn't decrease its' vigor from year to year. Is someone watching over it? It has no scent except the sometimes elusive fragrance of fond memories! 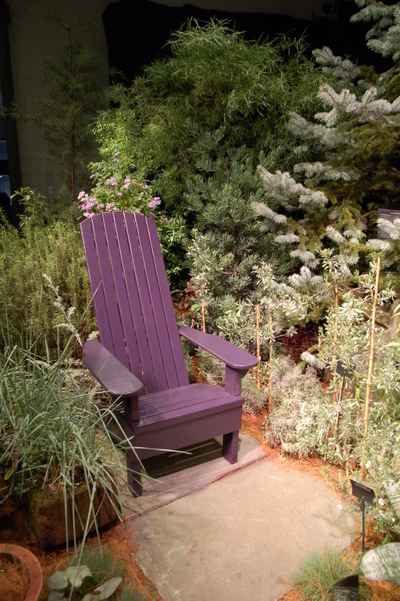 Each of us has our own story and history concerning our love of plants so, where do you get your love of gardening?